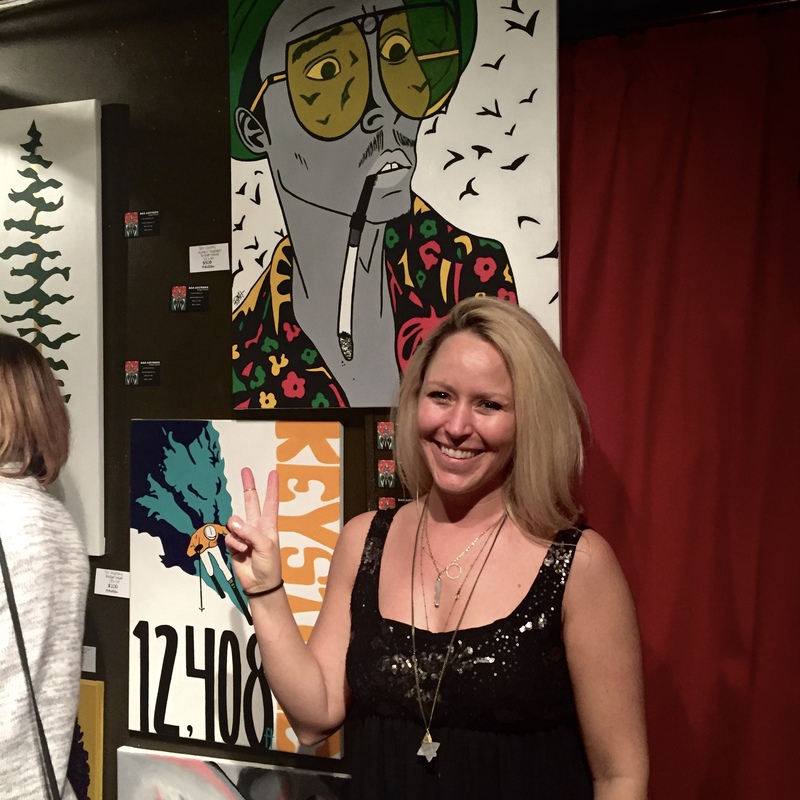 ARTIST OF THE WEEK *HOLIDAY EDITION*: Lexis Krieg + The Sol Shine yoga studio and gallery in DENVER, CO! 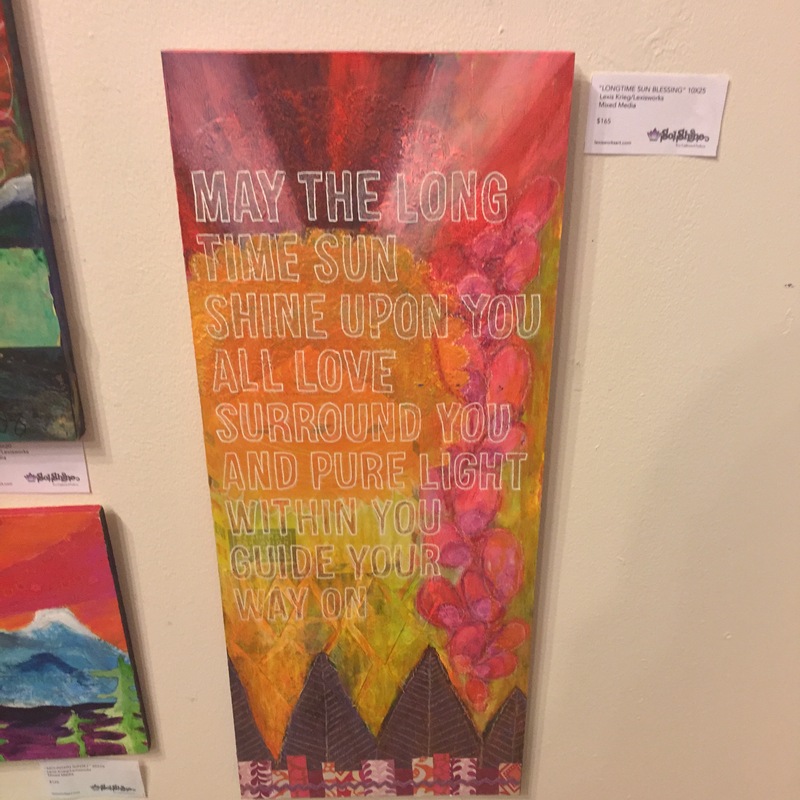 I had the pleasure of meeting this week’s #ARTISTofTHEWEEK in person at an amazing local Denver yoga studio and boutique – The Sol Shine! The oh so colorful Lexis Krieg and I enjoyed meeting as if by magic at The Sol Shine holiday party on Dec 10th. It was a delightful evening of music, fashion, and local art. After meeting the creative force and boss lady of The Sol Shine – Dannie Huggs, a few weeks before at the ARISE holiday soirée, I was inspired to make it a top priority to check The Sol Shine studio! Stepping into the store I was immediately overcome by the wonderful smell of incense, a sensory bliss mix between herbal bath products, palo santo, nag champa, and LOVE. The size of the space and variety of products from around the world in the gallery really impressed me. I allowed my intuitive shopper skills to guide me to what really felt like it was mine. I ended up with a beautiful Lovestitch scarf that reads, “BEAUTY IS IN THE EYE OF THE BEHOLDER” and a greet mala bracelet with opalite made by hand locally. Meeting this week’s artist in person was awesome. I selected her for the feature because I immediately loved her colorful Colorado style. Her work is so affordable she makes it possible to buy her originals. You can see her collection in person now at The Sol Shine or check her out online via the links below. Wishing each of a fabulous holiday season! 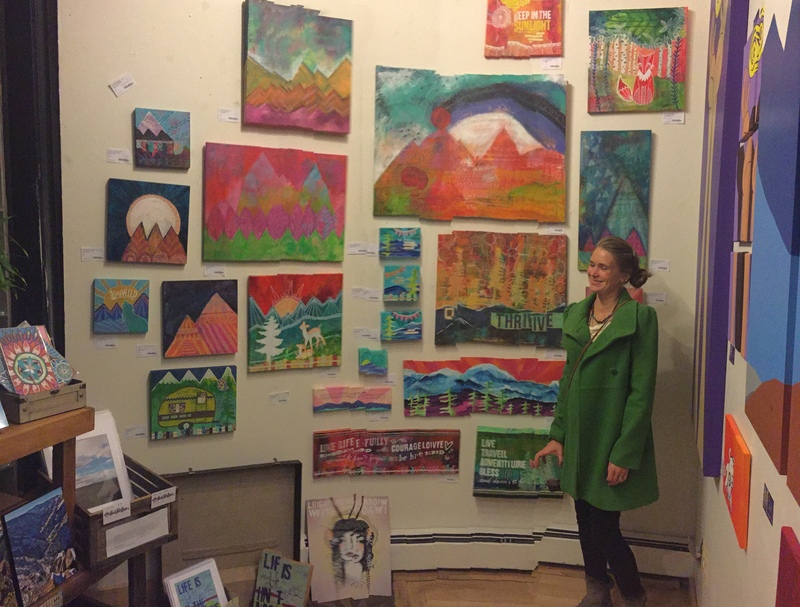 I encourage you to support the growing local Colorado artist community by giving the gift of amazing art this season. Below: Dannie Huggs OWNER/BOSS LADY of The Sol Shine in Denver, CO! Higher Society New Years Eve at City Hall in Denver with Alex & Allyson Grey!